Objective – Students recognize that the types of line and shapes are used to create “little Green”. Procedure - Read Little Green by Keith Baker. 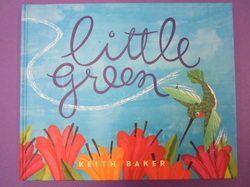 Discuss the lines and shapes left by Little Green as he flies through the story. Model drawing Little Green by using an oval for his body, triangles for wings, small oval for his head and triangle for his beak. He can be drawn in a garden scene with the lines of his flight drawn in the sky. Paint with watercolor.